What is the working title of your book? 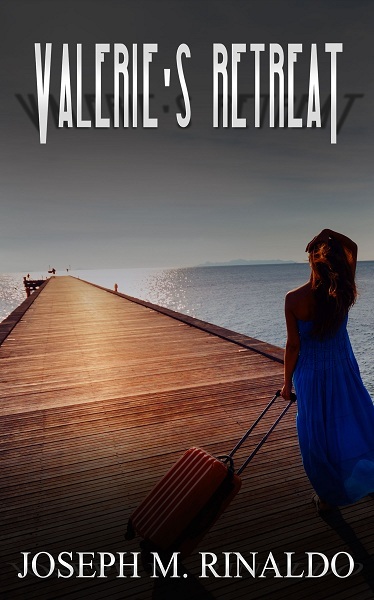 Valerie’s Retreat is the title of my book. Retreat has a double meaning. Valerie wants to remove herself from a difficult situation and she wants to find a place of sanctuary. Do you write under a pen name? (If yes, what is your pen name?) No, I write as myself. My writing is out there for the world to see. Where did the idea come from for the book? Valerie's Retreat, follows the life of a forty-one year-old woman who happens to fall in love with a man sixteen years younger. My wife is sixteen year older than I am, so that might have helped foster this idea for a book. The jokes Valerie must endure, such as, "Do you have to cut his meat for him?" are actual barbs my wife received during our dating process. Like Valerie, I also worked in a bank. Unlike Valerie, I never considered robbing the bank where I worked. Valerie doesn't consider herself a "Cougar". Franco, her boyfriend, happened to attend the same church singles dance on the same night. They talked, talked some more, went on a date, and presto- they're boyfriend/girlfriend. That's how it happened with my wife and me. "Cougar" makes the women dating younger men seem somewhat predatory. That isn't the case at all with Valerie or my wife. For the record, my wife never considered robbing a bank either. Well, maybe considered, but never planned it out. What genre does your book fall under? Valerie’s Retreat is a Romantic Thriller. She falls in love, endures traumas due to the vileness of others, and commits a “little” felony. Do you have other published works? ? In addition to Valerie's Retreat I have three other books published that are available on Amazon. A Spy Home is a memoir of a former spy who near the end of his career comes to the realization that his life's work of promoting rebellion in third-world counties for American interests was a waste. Out of bitterness, he steals over nine million dollars on his last mission. The money was meant for a pro-American rebel group in an impoverished country. His retirement is spent learning what he missed at home with his family and wondering if the CIA will figure out he has their money. Hazardous Choices describes the difficulty a young man has trying to fit in during his first year of college. In Chicago he served as a gangbanger for the vicious Neptune Knights, and in a small Kentucky town where he received a scholarship to play division two football he tries to fit in with the other students. His understanding of the world doesn't make much sense in this environment. A Mormon Massacre tells about a young man in his early twenties who had been raised hating the Mormon church. To fight what he believes is a cult, Jeremiah goes undercover as a convert to rescue women from abusive plural marriages. Which actors would you choose to play your characters in a movie rendition? That depends on who’d be willing to settle for what I’d pay. Seriously, unlike most movie watchers I don’t look for known actors. For example, Jennifer Lawrence brought Katniss to life in The Hunger Games and although I later found out she’d been in several shows, I’d never heard of her when I saw that movie. What is the one or two-sentence synopsis of your book? Valerie’s Retreat gives the reader a woman fighting inner demons who must deal with an unfair, sexually harassing boss. While you, the reader, may see some things about her you like; you’ll probably see some things you don’t; the amount of compassion and tolerance you should give her is debatable. Is your book self-published, or represented/published by an agency? We self-publish. We being my wife and I. We have a great professional relationship. When one is working, the other leaves the room. How long did it take you to write the first draft of your manuscript? That's harder to answer than one might think. I wrote the book in a few months, since I was working part-time. However, I reread/edited it twice, my wife edited it once, and we had a professional editor. Start to finish, all of that takes somewhere in the nine month range. What other books or authors would you compare this story to within your genre? This book falls into the genre Romantic Thriller but I hope it's more dynamic than being described by those two words. Hopefully the reader will finish a scene where something goes wrong for Valerie and think about how they might handle the same situation. At one point Valerie and Franco feel like they just don't have any good options. That leads them to make extreme choices. What would have to happen in your life for you to commit a felony? How bad would things have to be? That breaking point is the interesting driving focus of Valerie's Retreat. This book doesn’t follow the Romance format perfectly and it doesn’t follow the Thriller format perfectly, I am pleased to say. Just because the reader knows the genre, I hope the plot is unpredictable like Gillian Flynn’s Gone Girl. Who or What inspired you to write this book? My background has a teeny influence on Valerie's Retreat. Valerie meets a man sixteen years her junior at a local church dance. My wife and I have the same age difference and met at the same kind of place. We still smile at each other when we drive by that dance hall/community center even after fourteen years of marriage. Dang, we're cute! Seriously, like my wife, Valerie is NOT a cougar on the prowl. We met long before anyone heard that term. Valerie wasn't searching for any kind of specific man, she just happened to find Franco. He happened to be younger, and neither of them cared. What else about your book might pique the reader’s interest? Valerie is very likeable, outgoing, and appears to be a generally happy person. Yet, inside she has vicious demons demeaning her with bouts of insecurity and inadequacy that she hides. This is a contradiction that is difficult to put in print, but the reader will understand the conflict. We all have inner turmoil. Are there any writing-related websites you have found beneficial in your writing? Most of the help I’ve received as come from reviewers, Facebook author groups, and LinkedIn. Use the people out there to bounce ideas around and see what other people have tried. The important thing to remember is that no magic bullet exists. You have to keep trying new things.